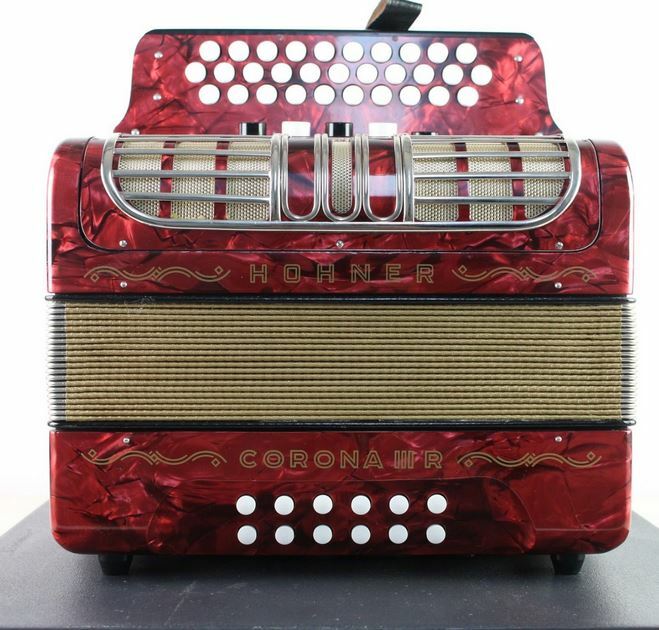 Two Row C/F Hohner Button Accordion in good condition and tune. Ready to play. No case. $250 + S&H. 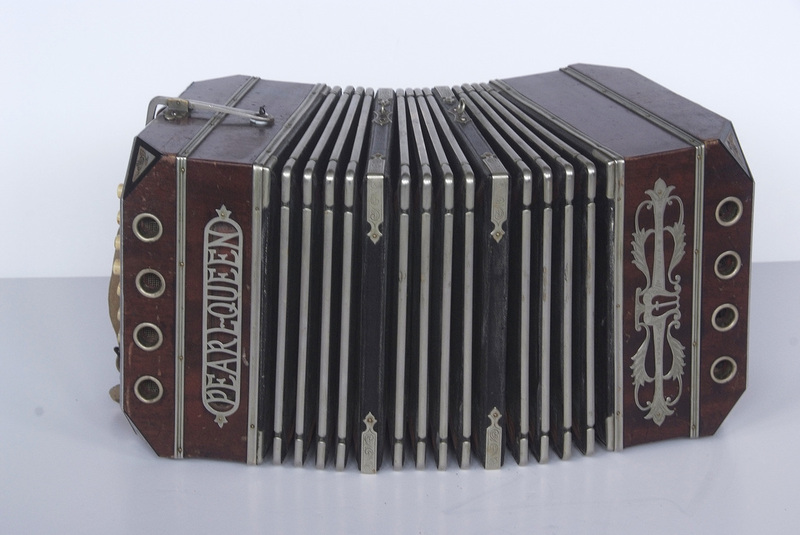 This fine three-row button accordion is barely used, for all practical purposes, brand new. It has 5 treble registers and 12 bass buttons. It is tuned to CGF and comes with a hard case. Priced at $1100 plus shipping. 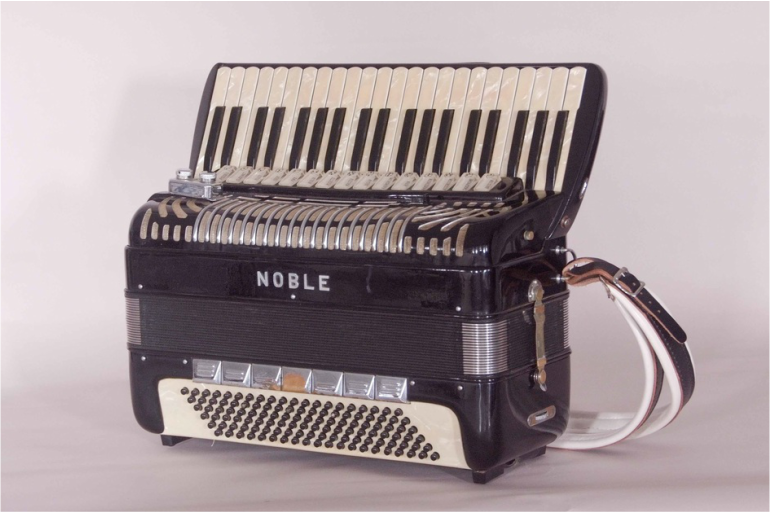 An older full sized Nobel accordion, well maintained, and in good condition. The action is firm, low and tight. It has hand-made 4/5 reeds and has great sounding bassoon reeds. It would be a great jazz accordion, but was played professionally in an old time band. The case has seen better days and there is brassing on the bass shifts and bellows closure straps. Newer shoulder straps. Priced at $1300 plus shipping and handling. A solid 18# Fratelli Crosio 120 bass in good condition. Nice sounding 2/4 reeds. 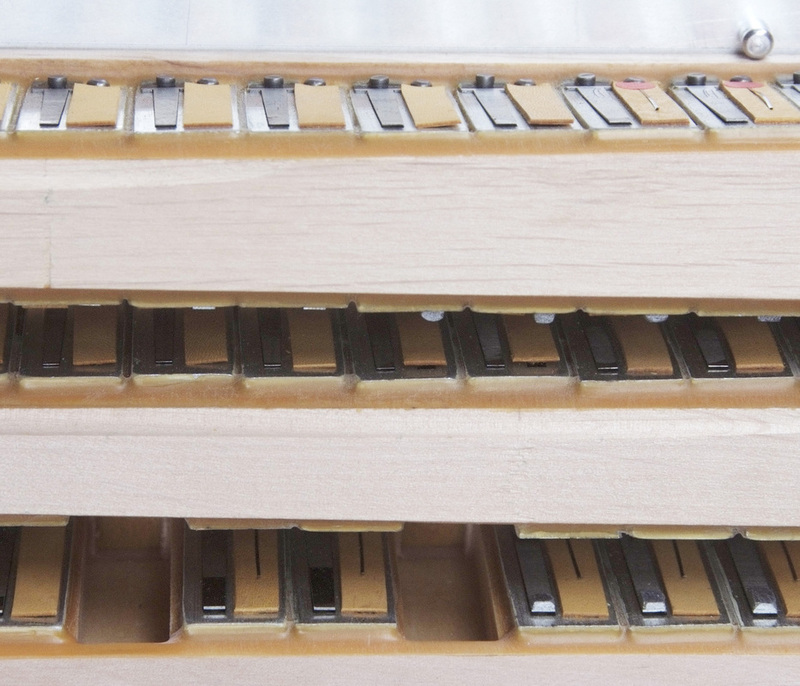 39 treble keys in a narrower 17" keyboard. Includes good case. Has pick up and cord: $550 plus shipping. This 50's vintage Tiger accordion is new and has never been played. It is obviously one of a kind and should be part of a collection. It is priced accordingly at $3000 plus shipping. It comes with the original new straps and carrying bag in the (very weathered) original shipping container. Pearl Queen concertina in fair condition. 8" x 8" x 12," Key of "C." Includes case. $300 plus shipping and handling. Bare bones 48 bass Francini, 34 treble keys. Feather weight. No register shifts. Low/medium treble reed sets. Has a decent, full sound and nice wide keys for larger hands. Some brassing of the chrome, but otherwise in good cosmetic condition. Good solid case. $250 plus shipping.